Medstars’ Annabel Beales and consultant plastic and reconstructive surgeon, Mr Bruce Richard, explore everything you need to know about rhinoplasty. Why would you have Rhinoplasty? There are two main reasons for wanting rhinoplasty. You might be insecure about the way your nose looks. In this case, the purpose of the surgery will be to make your nose look right for you and in turn make you feel less self-conscious. This is known as cosmetic rhinoplasty. On the other hand, your nose might be causing you problems unrelated to your appearance. An injury to the nose can cause long-term pain, or you might have breathing problems such as snoring or sleep apnoea. In this instance what’s known as reconstructive rhinoplasty can help to alleviate these problems. We cover the who, what, why, when, where and how of having the procedure. Who would you have it done by? If you are thinking about rhinoplasty, your first port of call should be your GP. Talking it through with your GP is recommended. They will help you to think carefully about whether having rhinoplasty is right for you. It’s important to recognise whether your desire for the surgery stems from unhappiness with your nose or in fact another area of your life. If it’s the latter, your GP will help you to address these problems. You can also discuss any other health problems that might interfere with the procedure with your GP. After visiting your GP you can decide on a surgeon. It’s paramount that your surgeon is registered with the General Medical Council (GMC). You should also check that the hospital or clinic where your surgery will be performed is registered with the Care Quality Commission (CQC.) It’s important to visit your clinic and have a consultation with the surgeon who will carry out the procedure to make sure they are right for you. When you meet with a surgeon they will discuss with you what can be achieved. Medstars plastic and reconstructive surgeon Mr Bruce Richard explains that “often patients have a strong sense of not liking their nose but find it harder to describer exactly what it is that they don’t like. If it is obviously deformed or has a huge hump that is relatively easy to explain, but often it comes out as more of an emotion than a description. Like I hate my nose’ or ‘just make it normal’”. The NHS recommends writing down a list of questions to ask them so you have all the information you need. It’s important to remember that the outcome of your surgery will depend on the size and shape of your current nose, the condition of your skin and your age. Keep in mind that your nose changes as you age over the years! You will be able to have your rhinoplasty done on the NHS if you can show that there is a medical need for it. If the purpose of it is purely cosmetic then it is unlikely that the NHS will pay for it. Rhinoplasty prices in the UK typically start from around £4500 and can cost over £7000. The exact price will depend on the experience of your surgeon and the specifics of your procedure. Be sure to factor in the cost of pre and post-op consultations and any aftercare when planning for the surgery. A rhinoplasty is performed in a hospital or private clinic. You will usually need one or two nights in hospital post-surgery before you are able to go home. There are two ways to perform a rhinoplasty. Open rhinoplasty involves making a cut across the columella- the skin between the nostrils- before lifting the skin off the nose and shaping it as planned. The benefit of an open rhinoplasty is that the surgeon has better access to the structure of your nose. On the other hand, there’s a longer recovery time and a small scar will be visible afterwards. 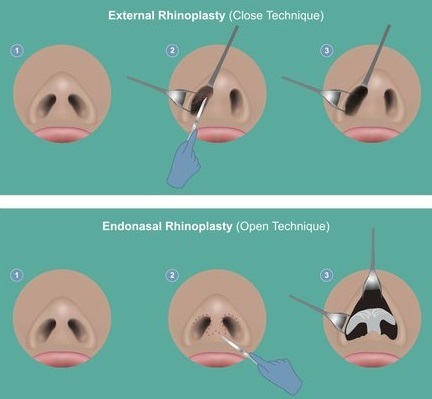 Closed rhinoplasty, which comes with less swelling and visible scarring, is when the surgeon makes all of the incisions inside of the nostril. It is the more common form of rhinoplasty and has a shorter recovery time. Your surgeon does have less access and visibility to your nose- but they should be skilled enough to stop this being a problem. The procedure usually takes between an hour and a half to three hours. When will you start to recover? For the first week you won’t be able to breathe through your nose. You might need painkillers to relive any pain. You may also suffer from light nosebleeds over the first few days. It can take up to three weeks for bruising and swelling to reduce and up to six months for the swelling to completely go down- you shouldn’t expect to see your final nose before this! Of course, if you have any problems after your rhinoplasty you should contact your surgeon to rectify the problem as soon as possible. You can book a consultation with Mr Bruce Richard, who has specific expertise in rhinoplasty, facial deformities and facial nerve reconstruction, here.